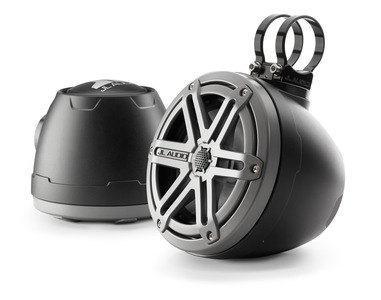 Ideal for powersports, marine and off-road vehicle applications, these enclosed speaker systems include high-performance, marine-grade coaxial speakers with silk dome tweeters housed in rugged, injection-molded enclosures to deliver clean, loud audio. 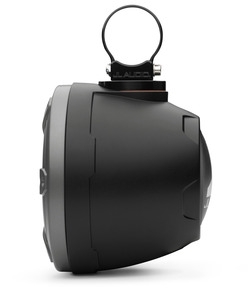 A rotating clamp receiver is included with each VeX™ pod to mate with an appropriate fixture (sold separately) for mounting to a flat surface, roll-cage or tower structure, allowing precise aiming for optimum sound. Pipe mounting fixtures (sold separately) are available in a variety of sizes to fit a wide range of tube diameters. A weatherproof, Lexan™ rear logo appliqué trims the rear of each pod, which can be oriented to match any mounting position. For convenience, ten feet of our 16AWG marine-grade, parallel conductor speaker cable is included with each VeX™ pod. Although VeX™ pods can be used with as little as 20 W per channel, we recommend powering these systems with an amplifier capable of 60-100 W of continuous power per channel. For best results, use with a subwoofer. Like all JL Audio marine speakers, this system is weatherproof and built to deliver years of listening enjoyment.